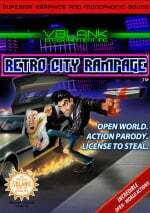 Grand Theftendo may have started out as a pet project of Vblank Entertainment's Brian Provinciano, but eight years later it's turned into one of the most intriguing games slated to hit WiiWare in the form of Retro City Rampage. The novelty of an 8-bit open-world game was enough to put it on our radar, and the amount of promised content easily puts it among our list of most anticipated downloads. We caught up with Provinciano to get the scoop on his project of eight years and were relieved to learn that, finally, a game may do Saved By The Bell justice. 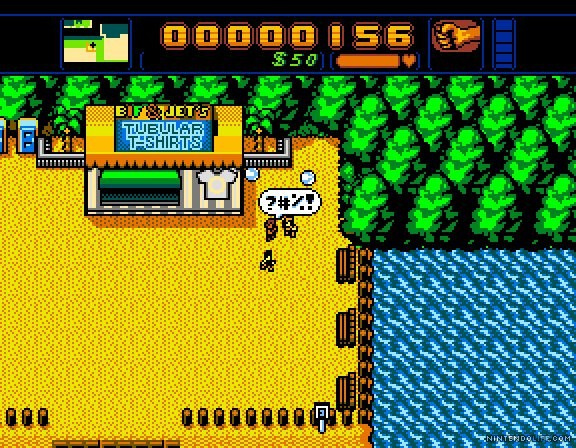 Nintendo Life: How about we start with a little explanation of what Retro City Rampage is for those who don’t know. 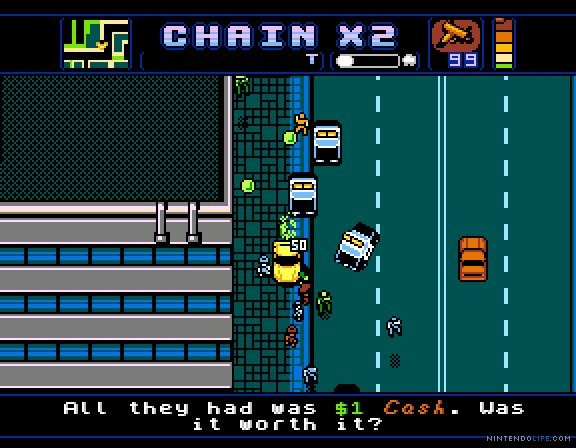 Brian Provinciano: I describe Retro City Rampage as an open-world action parody, so you can imagine Grand Theft Auto as if it were on the NES and then it just mashes in everything else you can imagine — other games, TV shows, movies of the era — and combines them into the mechanics, the mission design, the story, vehicles, characters, everything (laughs). 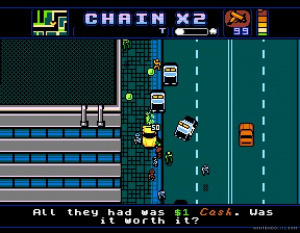 NL: Retro City Rampage has been in development for a long time. It started off as a pet project, correct? That’s right. Back in 2002 I came up with the idea to start doing an NES GTA, 3 specifically. I just wanted to do my own GTA game. I was also really really fascinated by NES development, the limitations of the NES and programming in assembly language and all of that, as well as making an 8-bit game allows a single person to actually do it because there isn’t as much of the art involved and all of that, so the one-man show was able to happen. NL: What was it about GTA 3 in particular that drove you to it, as opposed to the other top-down GTAs? Well, I was a huge, huge fan of the others, especially GTA 2, but 3 just was really exciting at the time. And also, I guess it was the idea to port this 3rd-person game to be top down, whereas with the other ones it would be more like just downsampling an existing game rather than putting a new spin on another one. NL: What did you originally hope to do then? Mainly just finish it and get it out there. Back then I was really, I still am but since time is a bit of an enemy now it’s changed things, but back then it was all about the experience. I would throw myself at these huge projects just with the idea that if I finished it then that would mean that I would’ve learned the AI and this and that. That was actually what I had done even before then, I had done a development system for the old Sierra adventure games, like Leisure Suit Larry and King’s Quest. That was another thing, I started that project in 1998 and finished it a few years later, and was successful in that. The premise was basically that when I started I didn’t know how to do everything I needed to do but I knew that I’d learn, and by the time I did finish I would know everything, and that’s exactly what happened. NL: At what point did you stop and decide to take it in its current direction? It was an evolution. It was probably around maybe late 2005, early 2006 when the change happened. It originally just started where the city was GTA 3’s first island, but I started throwing in a few of the parody buildings in there. 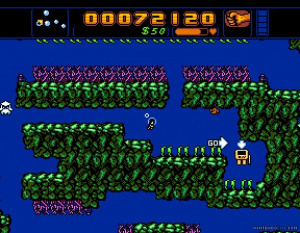 The first few were a play on the Monkey Island bar and the Leisure Suit Larry bar, and from there it started to get a little more unique and I came up with the idea “hey, wouldn’t it be funny if I threw in a mission where you’re working for Leisure Suite Larry?” From there, the next stage was when I was working on jump code and what would happen when one character was on top of another character. You’ve got a few options, you can either make them stand on top of the head or slide off or whatever, but then it just dawned on me, why the heck not make it like Mario? That was the big lightbulb when everything fell into place and it became what it is today. NL: You were the only one working on it for a few years. How many people are plugging away at it now? We’ve got three musicians, one of whom does sound effects, and an additional pixel artist. NL: How large is the world itself? Compared to, say, a map in the first GTA. The character himself is 8 pixels wide, and the world is 8000x4000 pixels. It’s quite large and it’s got a lot of interiors; well over 30 interiors [currently] and it’ll have more as well. So you can go in a fair number of buildings. NL: Which homage are you the most proud of? Hmm, that’s a good one. I guess I’ll have to say Saved By The Bell. NL: (Laughs) Did not see that one coming. Yeah, I don’t know how many people know about the Saved by the Bell parodies in the game yet, but that’s something where I think enough time has passed where we’ve all reached an age, who grew up on Saved By The Bell, to be in a position to do something like this. Saved by the Bell is now retro, I guess. NL: It’s been about, wow, 20 years now, hasn’t it? NL: What types of scenarios can you get yourself into? Considering the GTA influence, there must be some side quests or other shenanigans to engage in. I can take you through a few of the things. 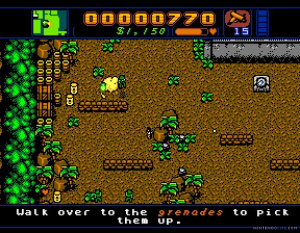 In the beginning you’ve got the Commando-style stuff that plays off the old military games, and through there you’ll be taking cover, using grenades, blasting through gates, taking a Jeep, rescuing a prisoner, heading to a chopper. A lot of that is along the lines of GTA 4-type stuff. 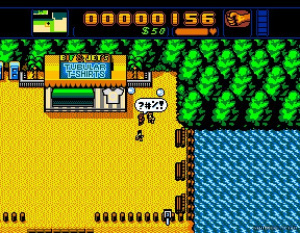 And the Saved By The Bell stuff playing off the zero-tolerance of weapons and keeping things more tasteful since you’re fighting these high school kids, it’s all melee hand-to-hand combat, so that’s where it fleshes out and gives the player the experience of melee and beat-em-up. The Ghostbusters stuff also plays off Monkey Island a bit; you’ve got a proton pack-type thing that shoots ionized root beer, so if you remember the Monkey Island reference, ghosts were killed with root beer. With those ones, they focus more on being like old arcade games. So the first one is a rootbeer tapper style game where you fill up your proton pack and uses a catch-and-toss mechanic. Another one is called Throw Out Your Dead, that’s one’s kind of a...I call that one a bit of a Burger Time, although it’s not quite like that, but again a catch and toss where things are being thrown out of windows of a building, dangerous things, where you need to catch the right things, toss them, and dodge the dangerous things. 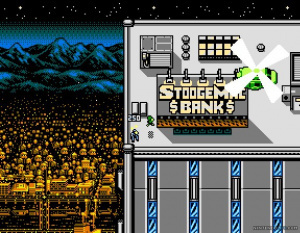 NL: How large is Retro City Rampage? It’s got a lot of pick-up-and-play appeal to it, but if you just wanted to do everything, how long would that take about? I really can’t say for sure yet, but it’ll have over 40 story missions and well over 30 spree missions, which are the replayable arcade-style score-based ones. And around town there’s still the outrunning the cops that everyone loves. There’s actually quite a depth to it as well; to give a little tease, it’s going to be more than just the police and the army chasing you. People have a lot of fun with that. Also around town you can go get your hair cut, steal TVs and sell them to the pawn shops, buy hats. Then there’s gags around town like buying drinks and launching cars in an Earthworm Jim parody, and a lot of exploration like hidden packages if people want to do that. NL: Does the game do anything to take advantage of the Wii’s motion and IR controls? It doesn’t. I’d love to do something like throw in a Duck Hunt-style game or whatever, but it’s getting pretty close to trying to ship it so there isn’t much time. For a sequel, I’d definitely allocate time for that into the schedule. NL: Is there a multiplayer component of any kind? There isn’t. It’s fully single-player but I wouldn’t rule that out for a sequel. NL: There’ve been an awful lot of, sort of neo-NES and retro sequels out in the past year, like Mega Man 9 and 10 or even the minigames from No More Heroes 2. 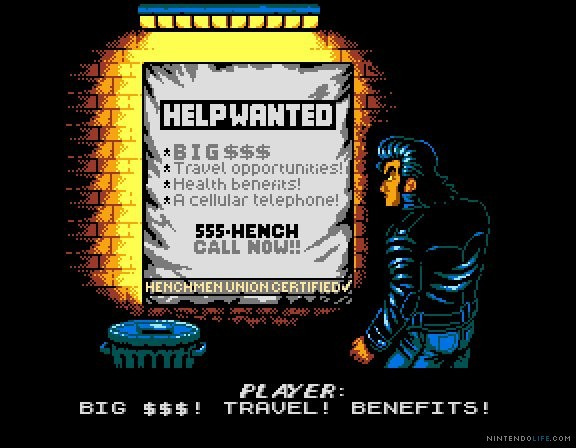 How does Retro City Rampage differentiate itself from those? 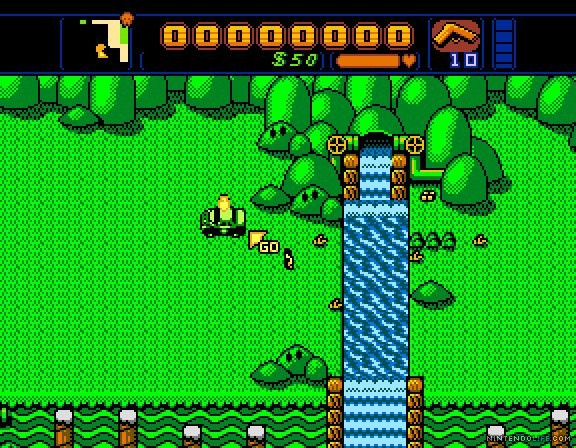 For someone kind of burnt out on the style, how is it not just another 8-bit looking game? It’s got a heck of a lot more variety I think. I haven’t played No More Heroes yet, and I really have to I’ve been told by a few people. 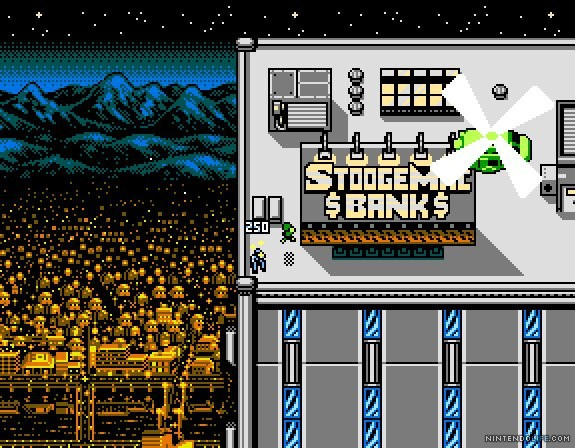 Mega Man 9 and 10 are quite linear, and Retro City Rampage has a lot more depth to it and variety of what you can do. A lot more comedy too, the comedy is a big thing that a lot of people are really in love with. There isn’t really a free-roam kind of thing in Mega Man, you can replay the levels over and over, but in GTA-type games and Retro City Rampage you can...most people, it’s kind of funny, I have playtesters come down to play the story missions, but they just pick up the controller and start driving around, running people down and outrunning the cops. And 15 minutes later they’re still doing that and I say to myself, “Well they’re really not doing anything wrong, they’re having fun, so nothing wrong with that.” (laughs) Then maybe when they die at some point I tell them, well, let’s start a story mission. That’s not really something you can do in a Mega Man. NL: When are you hoping to release it? Any idea on pricing? I’m aiming for December and I think it’ll probably be around $15, but it’s still up in the air. The main thing there being that it’s a heck of a lot larger than Mega Man 9 or 10, and those are $10. Even at $15 there’ll be a lot of value. Nintendo Life would like to thank Brian for his time. Every single thing I hear about this game makes me want it more. this looks pretty cool. it's not gonna be rated M is it? @pikmaniac02: They're shooting for a T rating. $15? Ouch. Looks really good though. I'm actually looking forward to this, which I didn't expect to be doing. Looks ace though. 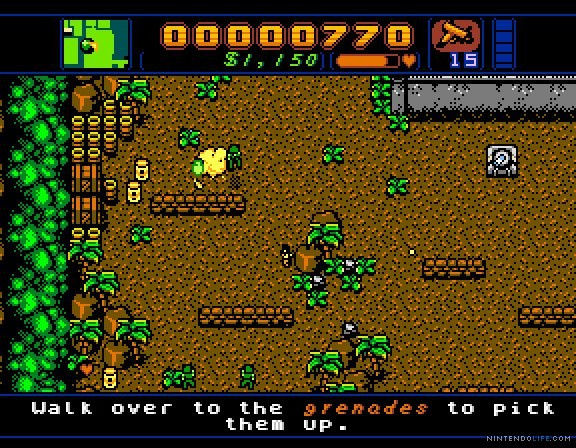 This game has quickly become a must have for me... every screen I look at reminds me of a scene from one NES game or another: Double Dragon II, Ikari Warriors, The Jackal, River City Ransom, TMNT (NES)... wait... is that a blooper I see in one of the photos AND a bomb you must disarm a la TMNT (NES). Yeah... instabuy! That box art looks like something you'd see in an NES box art. Wait, why would it be T? sounds fantastic. another great addition to the steadily improving WiiWare library. Little by little I am starting to anticipate quality WiiWare titles. RCR and Fluidity have me really anxious! I hope it turns out well, it looks like something I could really sink my teeth into. This game looks awesome. The trailer on the website looks amazing. I'm all about living in the past when it comes to my gaming. The more 8-bit games, the better. This game looks freaking awesome, day one purchase for me! This game looks so awesome. Hopefully it'll be 10-12 dollars but I can settle with 15. It's just 500 more points, it's not like they are charging 3000 points for it. Wow, sounds very cool; can't wait. Sounds like a lot of work was put into it, but I'm sure it's been quite rewarding as well. @15.irken004: Hey, I'd pay $30 for it. Yep, do want. Day one. It reminds me of Earthbound. This sounds like it's going to be massive and 1500 is well worth it if so. 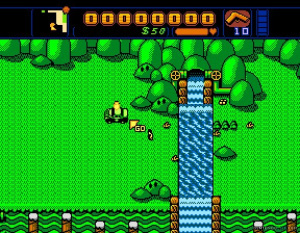 That's the clear advantage to doing these sprite-based graphics - more game in a smaller space! This game sounds like a real sweetheart. I think he went with $15 since that's usually the standard going price set for new PSN and XBLA downloadable games... and he has said that he's working on putting the game onto other platforms. Besides, $15 isn't very much at all for the amount of content you get. Think about it this way: It's only $3 more than Sin & Punishment. Regardless, I'm sooooooooo getting this for WiiWare day one. After each preview the game keeps getting better and better. I would pay $15 for it. I just noticed the cover art I almost fell to the floor laughing. Man i'm excited for this game. It would be cool to have it released just like an NES game. The price is a little steep for the casuals though who are already turned off by its appearance, but I guess this isn't made for them. I never really cared for Saved By the Bell when I was younger though. To those upset with the price, look at it this way: This is not the WiiWare you're used to getting. You know the type; you play it for about 5-8 hours and you're done. And that's a stretch. That's wringing it dry. I think WiiWare has something like a 50 megabyte limitation (someone correct me if I'm wrong). When you're dealing in 8-bit graphics, that means you can pack in as many hours of gameplay as you want. And based on this interview, some of the more obsessed of us may be spending 30+ hours on this game. Which, need I remind you, is easily more than twice as much as we spend playing the average $40 game these days. This is what WiiWare should always be, to me. Games with older-style graphics but huge longevity. Not stuff that pushes the system and wastes all of its allotted disk space on graphics assets. I've programmed games with graphics that were literally just Windows buttons and a lot of text, and they only take up a few megabytes, but they easily can contain tens of hours of gameplay or more if you play your cards right. I agree with CaptainDingo, WiiWare has so much potential going to waste. I rather see good quality 8 or 16 bit remakes or originals than crappy bargain console games. If it were up to me, which it should be, there should be a channel or system that does this exclusively. I would think and hope there is a market for that. Think of the possibilities...new metroid, super mario bros. 4, a new 8 bit zelda, castlevania, whatever. i would spend most of my allocated gaming money on all this before other console games for sure. Pipe dream, maybe, but still fun to dream about. This is going to be brilliant. I was interested the moment I saw that huge screenshot with 8bit graphics that July issue of Nintendo Power and read the words "open world". It was on my wishlist instantly. An open world crime game set in video game land with 8bit graphics is a great idea, I can see this being a huge hit. Well for now, I'm waiting for the release of this game, and visiting the site for it every day. Let's hope this game comes soon. There's no doubt that this is a day one buy for me.